The tradition often has emphasized our thirst for God. But Mother Teresa focused on God's thirst for us. When visiting a chapel of the Missionaries of Charity — the religious order Bl. Mother Teresa founded — one is immediately struck by the simplicity, indeed the austerity, of the sacred space. There are no chairs, pews, or kneelers. The sisters take their shoes off before entering the chapel and sit or kneel on the bare floor. Typically, there are no ornate pieces of religious art. Just a gold tabernacle behind the altar and a statue of Our Lady in one corner. The image that stands out most is a large crucifix behind the altar and the stark words painted in bold, black capital letters on the wall alongside it: "I THIRST." Mother Teresa said that those words in the chapel — taken from Jesus words from the cross on Good Friday — were a constant reminder of the purpose of the Missionaries of Charity. "We have these words in every chapel of the MCs to remind us what an MC is here for: to quench the thirst of Jesus for souls, for love, for kindness, for compassion, for delicate love." Ever since her call to serve the poorest of the poor in 1946, Mother Teresa insisted that the Missionaries of Charity were founded "to satiate the thirst of Jesus," and she included this statement in the founding Rules for the new religious order: "The General End of the Missionaries of Charity is to satiate the thirst of Jesus Christ on the Cross for Love and Souls." But what does this mean — "to satiate the thirst of Jesus"? Throughout the ages, men and women have expressed the human person's thirst for God. We see this in the famous Psalm 42: "As a hart longs for flowing streams, so longs my soul for thee, O God. My soul thirsts for God, for the living God" (Psalm 42:1). We see this also in the Catechism, which teaches that the human person has "longings for the infinite" which only God can fulfill (CCC, 33). Perhaps St. Augustine put it best in his prayer to God in the opening of his Confessions: "Our hearts are restless until they rest in you." Why does Jesus say "I Thirst"? What does it mean? . . . If you remember anything from Mother's letter, remember this — 'I Thirst' is something much deeper than just Jesus saying 'I love you.' Until you know deep inside that Jesus thirsts for you — you can't begin to know who He wants to be for you. Or who He wants you to be for Him. At this most difficult time He proclaimed, 'I thirst.' And people thought He was thirsty in an ordinary way and they gave Him vinegar straight away; but it was not for that thirst; it was for our love, our affection, that intimate attachment to Him, and that sharing of His passion. He used, 'I thirst,' instead of 'Give Me your love'. . . 'I thirst.' Let us hear Him saying it to me and saying it to you. Mother Teresa made Jesus' statement "I thirst" so personal that she told her sisters to imagine Jesus saying those words directly to them. She even encouraged them to put their own name before "I thirst" and hear Jesus saying, for example, "Sister Mary Vincent, I thirst." We can do the same. We can put ourselves in the silent presence of God, in a quiet place at home or in front of the Blessed Sacrament at church, and prayerfully imagine Jesus gently calling our name and speaking His parting words from the cross personally to each of us: "Ted, I thirst." Just put yourself in front of the tabernacle. Don't let anything disturb you. Hear your own name and "I Thirst." Just put yourself in front of the tabernacle. Don't let anything disturb you. Hear your own name and "I Thirst." I thirst for purity, I thirst for poverty, I thirst for obedience, I thirst for that wholehearted love, I thirst for that total surrender. Are we living a deeply contemplative life? He thirsts for that total surrender. What should our response be to Jesus' thirst for our love? When a suffering person in Ethiopia or India experienced torturing thirst, Mother Teresa would quickly bring water to satiate that thirst. In a similar way, Jesus thirsts for our love, and Mother Teresa desired to satiate His thirst by promptly responding to His will, by making sacrifices for Him, by loving Him in the people she served and by entrusting her entire life into His hands. "This is Jesus' word, 'I thirst' — for love, for souls not water." We can begin to satiate God's thirst for our love by being generous with Him with our time, by giving Him attention throughout our day, by spending more of our lives with Him in prayer. Mother Teresa also taught that we satiate Christ's thirst by loving Him in our neighbor — those people He places in our lives, especially those in most need of our care and attention. Most of all, Jesus thirsts for our lives to be completely surrendered to Him. He ardently desires that we be intimately attached to Him in such a way that we will not thirst for anything in this world that will lead us away from Him, the only "true and living fountain." This satiating Christ's thirst entails more than mere avoidance of sin; it involves a total yielding of our lives to Him — truly pursuing His plan for our lives. He thirsts for our entire lives to be surrendered to Him so that they may be used for His purposes. Many of us, however, are hesitant. We are afraid to entrust ourselves totally to Him. We cling on to our own plans. Meanwhile, Jesus waits for our response as he continuously says to us, "I Thirst". One small vignette from Mother Teresa's life exemplifies this point. She once told a religious — apparently someone who was hesitant to take a certain next step of faith in walking with the Lord — that Jesus "has a deep and personal longing to have you for Himself. Let Him do it." Like this religious, we, too, face moments when the Lord is inviting us to do something difficult, to step out into the unknown. He wants to act in our lives, but we, in our fear, sometimes hesitate or even turn our backs on the path where He is leading us. Mother Teresa inspires us in those moments to consider our life choices in the context of Jesus' thirst — as opportunities to satiate His thirst for our love: "Have we experienced His thirst? . . . Jesus came into this world to draw souls closer to His Father. . . . Just think, God is thirsting for you and me to come forward to satiate His thirst." Dr. Edward Sri. 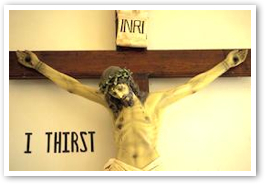 ""I Thirst": Mother Teresas Devotion to the Thirst of Jesus." Lay Witness (Nov/Dec 2013). This article is reprinted with permission from Lay Witness magazine and the author, Edward Sri. Edward Sri a professor of theology and Vice President of Mission and Outreach at the Augustine Institute in Denver, Colorado. Sri is also a founding leader with Curtis Martin of FOCUS (Fellowship of Catholic University Students). He resides with his wife Elizabeth and their eight children in Littleton, Colorado. Among his books are Into His Likenes Be Transformed as a Disciple of Christ, Praying the Rosary Like Never Before: Encounter the Wonder of Heaven and Earth, Who Am I to Judge? : Responding to Relativism with Logic and Love, Love Unveiled, Rediscovering the Heart of the Disciple: Pope Francis and the Joy of the Gospel, Men, Women and the Mystery of Love: Practical Insights from John Paul II's 'Love and Responsibility', The Bible Compass: A Catholic's Guide to Navigating the Scriptures, A Biblical Walk Through the Mass: Understanding What We Say and Do in the Liturgy, Mystery of the Kingdom, The New Rosary in Scripture: Biblical Insights for Praying the 20 Mysteries, and Queen Mother. Visit Edward Sri's website here.